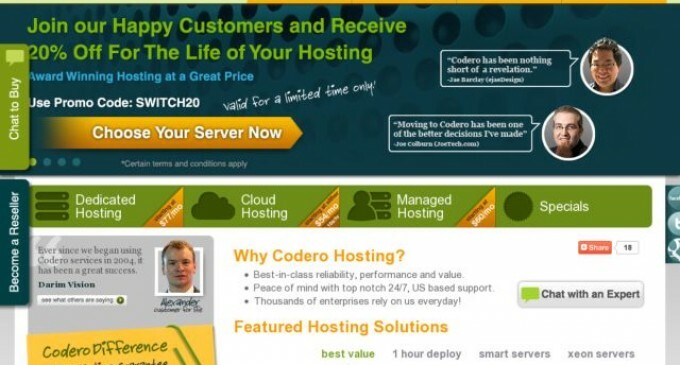 Web Hosting News – Codero announces the launch of its Cloud hosting beta this week at competitive prices for both the monthly and hourly billing terms. For a limited time, prices are even further below market price for those who sign up during the initial beta period. Set-up for both plans is at no charge and no contracts are required. The new on-demand service from Codero is available as both a pay monthly plan and an hourly plan. The hourly Cloud Computing plan allows consumers to turn on additional resources when their business demands it, and turn them off when their business does not, paying per hour of resource utilization, instead of being forced into a monthly commitment. Cloud is designed to be elastic to accommodate traffic spikes and other variable load applications. The Codero Cloud is especially well suited for sites that expect to grow rapidly and sites with cyclical traffic. It has a control panel giving users the ability to manage their entire Cloud offering online. Codero’s Cloud provides the benefit of changing the resources allocated to an existing Cloud VM, whether you want to increase or decrease the processing power, RAM or hard drive space.